The Global Risks Perception Survey (GRPS), discussed in the chapter “Fractures, Fears and Failures”, is the World Economic Forum’s source of original data harnessing the expertise of the Forum’s extensive network of business, government, civil society and thought leaders. The survey was conducted from 28 August to 1 November 2017 among the World Economic Forum’s multistakeholder communities, members of the Institute of Risk Management and the professional networks of our Advisory Board Members. The results of the GRPS are used to draw the Global Risks Landscape, Interconnections Map, and Trends Map presented, and to provide additional evidence used in the Global Risks Report. Global risk: A “global risk” is an uncertain event or condition that, if it occurs, can cause significant negative impact for several countries or industries within the next 10 years. Trend: A “trend” is defined as a long-term pattern that is currently evolving and that could contribute to amplifying global risks and/or altering the relationship between them. Selecting “very unlikely” means that you believe the event has a probability of occurring within the next 10 years of less than 20%. Selecting “unlikely” means that you believe the event has a probability of occurring within the next 10 years of between 21% and 40%. Selecting “somewhat likely” means that you believe the event has a probability of occurring within the next 10 years of between 41% and 60%. Selecting “likely” means that you believe the event has a probability of occurring within the next 10 years of between 61% and 80%. Selecting “very likely” means that you believe the event has a probability of occurring within the next 10 years of more than 81%. Respondents could then choose “significantly increase”, “somewhat increase”, “no change”, “somewhat decrease” or “significantly decrease”. Instead of applying an overall threshold for the completion rate, we set specific validity criteria for each question. Section 1 “The World in 2018”: Question 1.01: Only respondents who assessed at least three of the six risks listed in this question were considered (999 respondents met the criterion). Section 2 “Assessment of Global Risks”: The answers from the 871 respondents who assessed the impact and likelihood of at least one risk (the answer “no opinion” is considered a valid answer) were used to compute the results. Section 3 “Global Risk Interconnections”: The answers from the 719 respondents who selected at least one valid pair of risks were used in the computation. Section 4 “Assessments of Trends”: The answers from the 684 respondents who selected at least one combination of an important trend and at least one associated risk were used in the computation. Figure B1 presents some key descriptive statistics and information about the profiles of the respondents. For each considered risk, the share for each answer (“significantly increase”, “somewhat increase”, “no change”, “somewhat decrease” or “significantly decrease”) was obtained by dividing the number of respondents having selected that answer by the total number of answers. Respondents were asked to assess the likelihood and global impact of each of the 30 risks. For each risk, they were asked about the likelihood of the risk occurring globally within the next 10 years and about its negative impact for several countries or industries within the next 10 years. For the first question, the possible answers ranged from “very unlikely” to “very likely”. These five choices were turned into a 1–5 scale (1 = very unlikely, 5 = very likely). For the question on impact, respondents could select one of five choices: “minimal”, “minor”, “moderate”, “severe”, or “catastrophic”. These five alternatives were turned into a 1–5 scale (1 = minimal, 5 = catastrophic). Respondents could choose “no opinion” if they felt unable to provide an informed answer, and they could also leave the question completely blank. For each risk, partial responses—those assessing only the likelihood of occurrence or only its impact—were dropped.1 A simple average for both likelihood and impact for each of the 30 global risks was calculated on this basis. 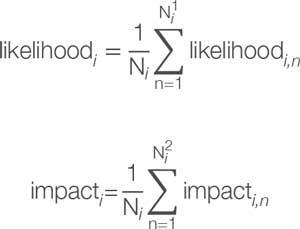 where Ni is the number of respondents for risk i, and likelihoodi,n and impacti,n are, respectively, the likelihood and impact assigned by respondent n to risk i. The likelihood is measured on a scale of 1–5 and the impact on a scale of 1–5. Ni is the number of respondents for risk i who assessed both the likelihood and impact of that specific risk (the answers of respondents who left one of the two questions blank were not taken into account). 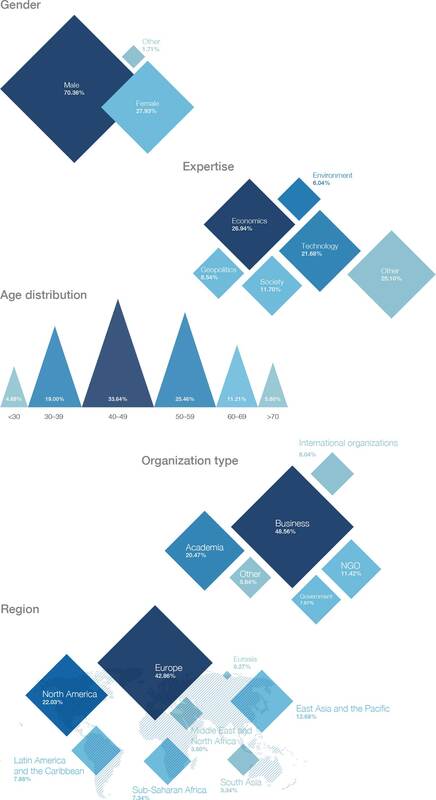 Similarly, for the Risks-Trends Interconnections Map 2018 (Figure II), respondents had to identify up to three trends that they consider important in shaping the global agenda in the next 10 years and the three risks that are driven by each of those trends. The two questions read: “Which are the three most important trends that will shape global development in the next 10 years?” and “For each of the three trends identified in the previous question, select up to three global risks that are most strongly driven by these trends.” The information thereby obtained was used to construct the Risks-Trend Interconnections Map 2018.
where N is the number of respondents. 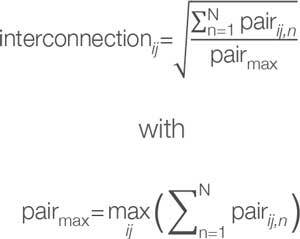 Variable pairij,n is 1 when respondent n selected the pair of risks i and j as part of his/her selection. Otherwise, it is 0. The value of the interconnection determines the thickness of each connecting line in the graph, with the most frequently cited pair having the thickest line. In the Global Risks Landscape and the Risks-Trends Interconnections Map, the size of each risk is scaled according to the degree of weight of that node in the system. Moreover, in the Risks-Trends Interconnections Map, the size of the trend represents the perception of its importance in shaping global development (answer to the first part of the question on trend, as explained above); the biggest trend is the one considered to be the most important in shaping global development. 1 If a respondent answered “no opinion” for likelihood or impact, his or her assessment of the other dimension (impact or likelihood, respectively), was retained.